The very last thing I did before heading to l'aeroport Jean Lesage in April 2013 was visit Chez Victor on Rue St-Paul next to Bassin-Louise. When I lived in Quebec City in 2008, I visited Bassin-Louise at least 3 times per week as they had amazing free concerts (Tokyo Police Club, Chocolat, We Are Wolves, Wolf Parade, among others). Anywho, Chez Victor was the same place my coworkers at my job back in '08 took me for my farewell lunch, but it was the Rue Saint-Jean location.. they knew I was obsessed with burgers and knew I would love it.. which I did! So checking out the Rue Saint-Paul location of Chez Victor was like a good memory for me. They had 500mL bottles of various varieties of Charlevoix Vobiscum - I chose the blanche because.. well, who doesn't love a good witbier? That meal was one of the best I had in Quebec City, the burger was better than anything I could get in Brandon and the beer was fresh and citrusy! Now, in November 2015: Charlevoix's Vobiscum Blanche is available in Manitoba, so you can tell I'm excited as heck! 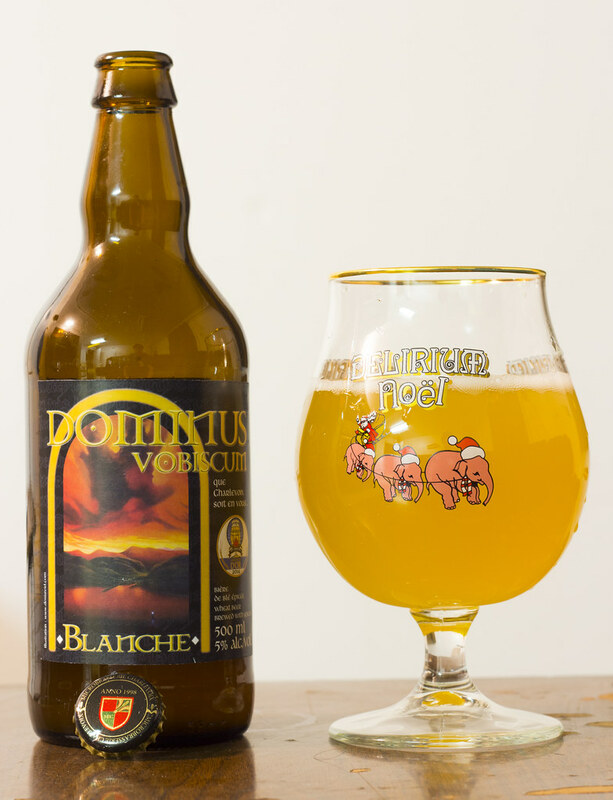 Appearance: Vobiscum Blanche pours a cloudy lemon yellow with a bit of sediment in it. A moderate amount of snow white foam on top that seems to go nowhere and a light amount of carbonation. Aroma: Beaucoup de coriandre.. lots of orange peel, Belgian yeast to give it a bit of a fresh dough aroma, a hint of lemon and even a sprinkle of pepper. This is stronger in aroma than a Unibroue Blanche de Chambly but not quite as strong as a Rickard's White. Taste: The first notes I get are Belgian yeast, candi sugar, a few squirts of fresh cut oranges, a moderate to high amount of coriander, a hint of mint, a hint of pepper and lemon zest. This is quite yeasty and carbonated as it's making me burp quite a bit. Overall Thoughts: An incredibly solid witbier that has a good citrus zest, easy to drink and is the kind of beer that people would associate with Quebec summers. Like the aroma, I feel that it's in between a Blanche de Chambly and Rickard's White for flavour as it has a great deal of citrus vibes, but not anywhere as much as Rickard's does. The Blanche is a great grainy wheat ale that I'll be buying a lot of until it's all gone in Brandon.